This has been a super busy month for me, I apologize for not getting around to blogging until this late day. For sensebridge, I launched the black Heart Spark product with a new website: sensebridge.com. It's oriented more towards the main-stream consumer, rather than the 'maker/hacker' like sensebridge.net. I intend to keep both going, they serve different interests, but my main goal for the fall is to diversify the product lineup offered at sensebridge.com, to have three or four different choices for 'electronic jewelry'. Should keep me super busy! Also this month I completed my first ever piece of artwork for a gallery. Turning over a leaf here for sure! I called it "Circuit Stitching", it's for an exhibit on embroidery (and modern interpretations of embroidery) to be held at WORKshop, an experimental design center located at 80 Bloor Street West, only about a 30 minute walk from where I live. The add for the new exhibit is actually up on their front page now, so you can see that, but not sure how much else I can really say about the exhibit itself. However, I am feeling free to talk about my own work, which was a combination of fancy embroidery that I bought in the fashion district ($100/yard!) and some circuit elements I assembled using conductive fabric, conductive thread, aniomagic LED sequins and a lilypad arduino. I think the work turned out *amazing*, especially given how much of the time I felt like I had no idea what I was doing. It's a double-sided piece, the front is the cool embroidered fabric flowers on a grass-print background, with the LEDs sewn into strategic positions. The back is purple velvet, with a ring of conductive fabric around the outside, and the lilypad in the middle. 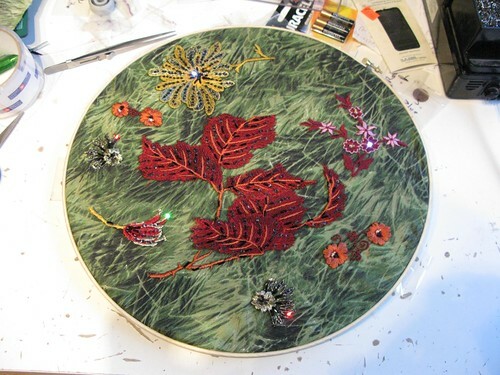 The conductive thread branches out from the lilypad to the locations (on the front) of the various LED sequins. There are 8 different patterns that the lights can light up in. I have a video of it in action, if enough people scream I might upload that. Or you can come to the gallery once it opens (supposedly late in October, if their renovations all go according to schedule). Meantime you can check out the Circuit Stitching flickr gallery, which shows many shots of the project underway. I have the opportunity to sell the piece after the show is over, which should be interesting. Given how much of my time it took, I'd need to get thousands, but it's also an utterly unique piece, so it might actually get that! 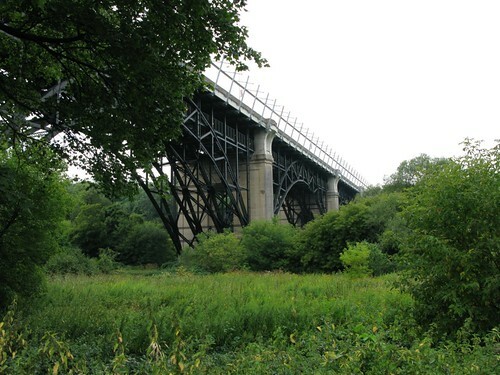 We also had the second Toronto Hike the Geek, we did the lower Don Valley, which turned out to be not nearly as scenic as I was hoping for! Mainly we got to see some pretty awesome urban infrastructure and graffiti. There is a long stretch in the middle of that hike where you are literally on a straight being of path, with river immediately to the left and fence immediately to the right, and it's super boring. We also got caught in a terrible thunderstorm right at the very end of the hike, DRENCHED I tell you. All in a good days fun :-). Check out the Don Valley Hike flickr set.